If it wasn’t for that amazing silk that came in the mail (and my wrist acting up), I think I could have finished this pair of socks in two or three days. But nope, I fell for the new yarn while the second sock was ignored. Sorry! The weird thing? The second sock came out a lot better, ie. it doesn’t have the loose ankle problem. This was a pretty fun pattern that you can easily memorize. This was my first Nancy Bush pattern and now I know what all the fuss is about. I followed the pattern faithfully, I didn’t find anything I needed to change. Why would I? It was well thought out and easy to follow. Another first for me was knitting with Tess Designer Yarn or even a superwash yarn. I picked this skein up when I went to Stitches East last year and the poor yarn has been waiting for me to do something with it for five months. That’s just not right. I’m glad I waited though, this yarn was perfect for this pattern. I love it’s stitch definition (so yummy with all this texture) and the subtle color variegation. I think this last picture is the one truest in color, a little bit of strawberry with some grape thrown in. Oh, a good reason for using this yarn comes to mind….I used almost all 450 yards in the hank for this pair of socks while the pattern requires about 400. For all of you that are sick of me knitting in reds or pinks, umm you can come back in April. Through no coercing of mine, Lolly made March ‘red and pink’ month. How lucky is that? This is just a partial selection from my stash* (if I had more than one skein of a certain yarn I only showed one) I get to choose from this month. It’s almost overwhelming, almost. I think I know what I’m going to work on this month, but I first want to finish Angelica and then maybe just let the red and pink yarns duke it out for my attention. *to see what each yarn is, you can follow this link. Gorgeous socks, Yahaira! And those red and pink yarns are lovely! Very cute socks! Thanks for the extra link with the yarn data. I was just about to ask you about one skein when I noticed it. I love pink/brown combinations. What lovely socks!I thought of you when I realized that March was pink and red month. You are in your element! they are absolutely gorgeous! pink and red month…gee i think you might be struggling. too cute! seriously those are some perty socks. i might just have to cast on for those socks in the near future. after i’ve finished knitting up my gazillionth jaywalker. . . I think your pink n red stash rivals my own. I’m loving that Interlacements yarn! So pretty. Your socks are so nice! Wow – those socks are gorgeous! And your yarn picture is darn fine, too. Have you seen Strange Little Mama’s red and pink Project Spectrum button for March? Your new socks are gorgeous, and I want to steal your yarn stash! I love so many of your yarns. Such gorgeous socks! If only I could finish mine so I could start some more! Great socks, and great red and pink selections. Very diverse stash–good job! Sock twins! well, at least yarn sock twins! Yours are so intricate and beautiful! I like the detail photo a lot, it really shows that cool heel. Great socks, Y. I love them!Project Spectrum for March is hard for me – I have SO much pink and red in my stash! I should have made two separate months for each color (and I still would have things to do!) You have some lovely yarns there ;)Have a good weekend! Lovely socks! You even made them the same color as they are in the book! you just HAD to post those lovely socks right after i post my remedial, beginner pair. oh, for shame!those pinks and roses are so deeelicious. 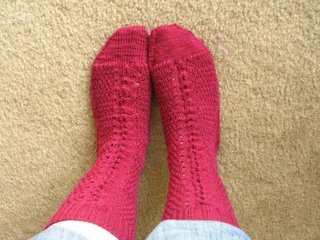 Aaaw, love the socks.I think you should avoid the stash yarn and knit the Cherry Blossom sock yarn I’m sending you. I love those socks! They’re so pretty! I’m jealous of all your red and pink yarns. I wish I had more yarn at in my stash at home because I don’t have a lot of money to go out and buy yarn. I know that yarn in the stash had to be purchased sometime but there’s something nice about using what you already have. 🙂 It’s easier to justify to the husband, too. Those socks are really awesome…I had to figure out what some of those yarns where, I am in love with pinks mixed with browns! Awesome socks! I have sock envy. I am going to learn to knit socks very soon. Do you like that book, Knitting Vintage Socks? Would you recommmend it? Lovely socks! Now I am wishing I could go knit some pink/red socks for myself soon!